golfing enthusiasts could possible desire, and all that just 30 km from Florence. UNAHOTELS Poggio dei Medici Toscana is located in the heart of Mugello, the wide green valley that stretches across the gates of Florence, along the course of the river Sieve. The numerous residences and castles are testimony to the historical and cultural importance of the territory that even today has managed to maintain its beautiful hilly landscape unchanged. 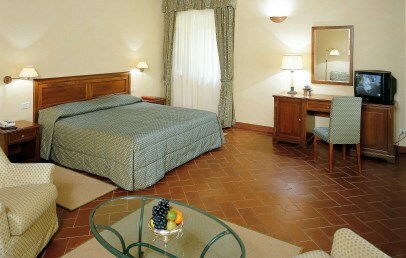 UNAHOTELS Poggio dei Medici Toscana is approx. 30 km from Florence and from Florence-Peretola airport. Set deep in the green of the Tuscan countryside, UNAHOTELS Poggio dei Medici Toscana was born of the restoration of an ancient farmhouse and of country homes and has maintained to the present day the same warm and welcoming atmosphere. Perfect for visitors looking to spend their holidays in close contact with nature, the Hotel and Golf Club offers guests access to one of Italy’s most prestigious golf courses as well as providing all the other services necessary for an unforgettable stay: pool, wellness centre, gym, restaurant, bar, 10 meeting rooms. The 70 rooms at UNAHOTELS Poggio dei Medici Toscana offer a balcony or relaxation corner in the garden, air conditioning and free Wi-Fi. All bathrooms have a bathtub and/or a shower, hairdryer and Aloe complimentary toiletries set. The hotel has adapted rooms available for guests with limited mobility. UNAHOTELS Poggio dei Medici Toscana’s spa offers a selection of beauty and wellness treatments for the body and mind. The spa has three treatment rooms, Turkish bath, outdoor pool and relaxation room with welcome kit: hot/cold drinks, fresh fruit and magazines. The hotel is located at the heart of the UNA Poggio dei Medici Golf Club, a prestigious 18-hole, par 73, golf course, firmly recognised as one of Italy’s best courses. Nestled in the wide Mugello valley and protected by the Apennines, the course offers a favourable climate and stunning views. With 5 different sets of tees, the course is suitable for players of all abilities and also offers a large practice range. Guests can also make use of the gym fitted with Technogym equipment, the 21x11 pool and the relaxation pool with hydro-massage corner, open from June to September. If you’re looking for a destination for your family holiday in Tuscany, UNA Poggio dei Medici will be delighted to welcome you with spacious rooms with terrace or garden and numerous services especially for our younger guests. Upon request, children aged 6 and above can join the Kids Club and reserve golf classes with PGA instructors. Located in the resort’s main courtyard, UNA Restaurant has a stunning terrace overlooking the practice range and the lake. Fully upholding Tuscan and Mugello traditions, the restaurant offers seasonal menus, themed evenings and culinary events inspired by regional and national excellence. Included in the room rate: outdoor parking, access to the spa, gym and pool, bicycle hire, pool table and Wi-Fi throughout the hotel and rooms (free unlimited Wi-Fi from Executive-level rooms and above). Paying services: minibar, room service from 7:00am until midnight, laundry service, access to the golf course and golf classes. Upon request we can organise aperitifs, events, themed evenings. Tourist tax – The municipality of Scarperia e San Piero requires the payment of a tourist tax to be paid on spot. 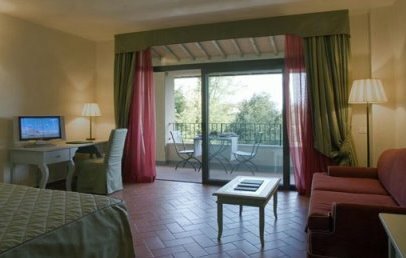 Comfortable rooms with a warm and welcoming design, Superior rooms are fitted with either a double bed or twin beds and offer a relaxation corner in the garden or balcony with views of Villa di Cignano. The en-suite bathroom has a bathtub and/or shower. Large rooms decorated in classic style, our Executive rooms are fitted with either a double bed or twin beds and offer an en-suite bathroom with bathtub and/or shower. 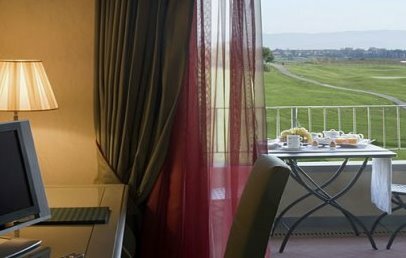 Rooms have a garden or balcony with views of the golf course.